Utilizing Wet-Type dust collection for food processing dust is relatively new. Cartridge collectors have been an industry standard for many years until recently. 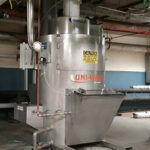 Uni-Wash UC Wet-Type Dust Collectors have increasingly been sold to companies looking for a way to cut costs and improve efficiency in food processing dust capture. Cartridge dust collectors require regular filter cartridge replacement and dust removal. The continued cost of filter replacement, down time during this process, and exposure to hazardous dust for the maintenance worker, together, can lead to significant costs. 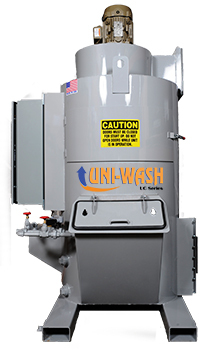 The Uni-Wash UC Wet Type Dust Collector uses a water scrub to remove dust particles from the air stream. Dust collection for the food processing industry has begun to realize the advantages of wet dust collection and its benefits over dry cartridge dust collection. Custom Stainless Steel Uni-Wash UC 30,000 CFM Wet Dust Collector built for a food processing company. ProVent excels in manufacturing dust collection equipment designed to work for your application. We listen to our customers make sure that the system will perform as intended. The ProVent Zone Ambient Dust Collector is perfect for polishing the air in any facility. Place them strategically throughout any processing area and you will be amazed how much dust is removed from your breathing air.